With Inception's reality-bending, mirror-existence, dream-vortex prism of a film, eclipsing the world with praise from all angles, I thought it would be interesting to take a look back again at another bounder-breaking feature, that has slipped between the cracks of time. 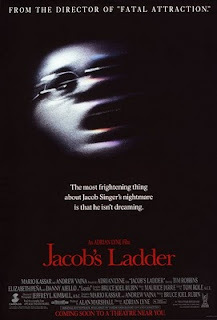 As far as I've been able to find, Jacob's Ladder created the genre. The same idea has been used again and again and again after the release of this film, but if there was another film with the same premise that came before it, I would be happy if you let me know. In contrast to Inception however, Jacob's Ladder is not an action film and doesn't rely on special effects to mesmerize the viewer. It relies on an amazing script. The pretty much perfect performance by Tim Robbins in the lead, doesn't hurt either. But now that I've (hopefully) sparked some interest for you to check this film out, it is essential that you learn nothing else about it. Don't read more up about it, and for god's sake don't watch the trailer. The less you know about this film, the more powerful it will be. There's a anime film called Paprika, deliciously weird, btw thanks for all those awesome movies, I'm looking all time for new stuff like this. People are often tempted to take hallucinogens before seeing Cult flicks... You *really* do not want to do that the first time you see this movie. Trust me on this.